I’m about half-way finished with the book sketching—a little over half of the Delegates And Delegation books are sketched, and a little under half of the Broken Wind books are sketched. I had a super-productive session Monday evening (Feb 4th), sketching in over 200 books over the course of about seven hours. Sessions since then have been less productive, topping out at around 90. If you’ve been watching this space hoping for movie reviews, I’m sorry to say I haven’t been going to the movies. It’s cold outside. Also, people who paid for books are waiting for me to get all this sketching done. 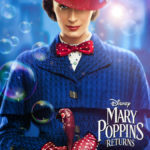 I’ll definitely be in the theater for Alita: Battle Angel, and Captain Marvel, but I’m not behaving like a responsible movie reviewer this month. I saw three movies in twenty-four hours. It’s possible I’m on vacation. Of course, I just spent an hour reviewing all three of them, so it’s also possible I’m actually working. My job is weird. In the interest of not pushing anybody below the fold, here are links to all three. Filmmakers, especially those working on the Marvel Cinematic Universe, have done a fine job of showing us what super-hero movies can be. 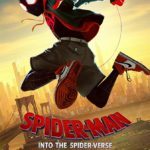 Spider-Man: Into the Spider-Verse, shows us what a comic-book movie can be. Also, it demonstrates the difference. A super-hero movie might be based on stories told in comics, but a comic-book movie tells its story the way a comic-book tells it, using tools that movies don’t often use. Marvelously, no, miraculously, it did that without being silly, or looking down its nose at the art form in the way the 1960’s Batman TV series seems to. I could say more, and do so at great length, but to my mind this film expands the very syntax of cinematography, making it difficult for me to describe the experience to anyone who hasn’t experienced something like it. As I can’t think of anything else like it for you to experience, I guess you’ll just have to go see it. 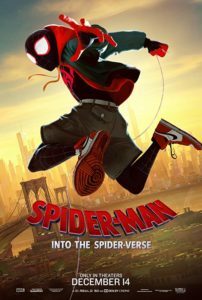 Spider-Man: Into the Spider-Verse clears my Threshold of Awesome, and additionally clears my “let’s spend enough money so all four kids can see it in the theater” threshold. On the one hand, Jason Momoa is frighteningly formidable, so I would never tell him to his face that Aquaman was anything short of awesome. On the other hand, Mr. Momoa seems genuinely nice, very much not the sort of person to punch people for rude and uncalled-for comments. As it is vanishingly unlikely for me to meet Jason Momoa in a circumstance where I’d feel even remotely tempted to diss any of his work, none of this is relevant. Besides, Momoa’s work was my favorite part of the movie. My only complaint is that Aquaman was far longer than it needed to be in order to tell the pair of stories it set out to tell. It is an origin story whose inciting incidents take place before the events of Justice League, and it is a hero’s journey story which takes place after the DC super-team-up. That may seem like a lot, but it didn’t need to take two hours and forty-three minutes. That’s not to say that the film wastes any time. Everything happening on screen was interesting and/or beautiful and/or exciting. I was never bored. And really, how do you tell Nicole Kidman that she’s going to appear in a mere thirty-seconds of flashback? The woman deserves serious screen time, and she makes the most of it. I suppose I could complain about the world building here, but DC comics has always pushed me out of the story with “Gotham,” “Metropolis,” and “Central City,” so I shouldn’t expect Atlantis to somehow make more sense. 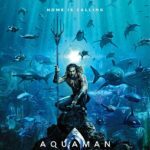 It might be best, then, to compare Aquaman to the other DC Snyderverse films: it was far better Batman Vs. Superman, and Man of Steel. It wasn’t quite up to the level of Wonder Woman, but it did have five times as much Momoa as Justice League. I think it fares pretty well. 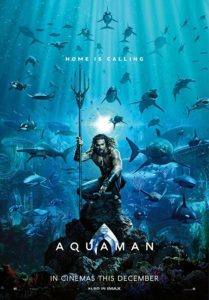 Aquaman doesn’t clear my Threshold of Awesome, but I’ll be picking up the Blu-Ray and watching it again when I can pause for trips to the restroom, and if you think it might be unfair for a relaxed bladder to be what puts a film over the top, well, you’re not wrong.